About half a dozen Village residents who oppose the Rudin development booed from the balcony of City Council chambers March 28, 2012, shook their heads and said Speaker Christine Quinn had let them down. CITY HALL — Concluding the city's seven-month review of Rudin Management's plans to turn the former St. Vincent's Hospital site into luxury condos, retail space and a public park, the City Council voted nearly unanimously Wednesday afternoon to approve the developer's plans. In a 48-1 vote, the City Council approved Rudin's request that the city rezone former St. Vincent's buildings to allow the project to proceed. City Council Speaker Christine Quinn — who worked with Rudin and the Bloomberg administration on modifications to the plan, including a reduction in the number of condo units and deeding the St. Vincent's Triangle park space to the city — called the final Rudin plan a compromise. 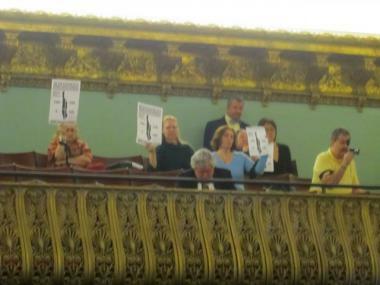 Some opponents of the redevelopment of the former St. Vincent's Hospital stood on the City Hall steps March 28, 2012. "Through the council's actions, this rezoning and a new health care facility are responsive to community concerns," she said. About half a dozen Village residents who oppose the development booed from the balcony, shook their heads and said Quinn had let them down. Rudin CEO and vice chairman Bill Rudin said teamwork with residents and elected officials helped create a plan that will bring additional jobs, a public park and environmentally friendly homes to the Village. "After more than five years, hundreds of public meetings and hearings, and thousands of conversations, the final version of the project shows what can happen when governmental leaders, the community and a development team work together," he said. 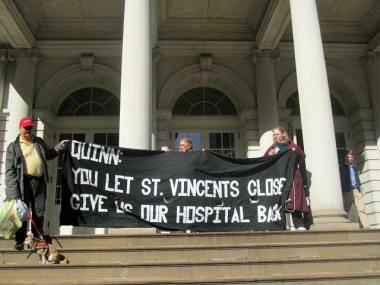 West 12th Street resident Elizabeth Adam, who said her proximity to St. Vincent's saved her life after she had a stroke at home in 2006, was one of three Rudin plan opponents who held a banner reading "Quinn: You let St. Vincent's close. Give us our hospital back" on the steps of City Hall after the session. "It is unconscionable that 1.5 million people on the West Side have no hospital," she said. "We demand a west side hospital." Councilman Charles Barron, who represents Brownsville and East New York and provided the only dissenting vote, criticized the "rich Rudins" for not helping restore a full-service hospital to the Village. "[Rudin] could have gone back to the drawing board to make the medical needs of the community met," he said. "This is a life-and-death issue. People could actually die." Despite the construction of a 24-hour emergency department, imaging center and outpatient surgery facility, the push for more complete medical services is ongoing, Quinn said. "We will continue the struggle in the Village to bring back a full-service hospital," she said.